The joy in gardening is in the activity itself as you watch your efforts sprout from the ground to a full plant. However, just like children, your plants need care and attention. You need to make sure they are getting the necessary nutrients to flourish and the appropriate protection from pests and diseases. In the following review, we include some valuable information and some suggestions of the best backpack sprayers you will find in the market. 1 Why do you need a Backpack Sprayer? Why do you need a Backpack Sprayer? As a gardener, you need a tool to help you in garden maintenance, and a backpack sprayer is one that comes to mind. A backpack sprayer is a pretty versatile tool that not only assists you to keep atop of your garden maintenance but also perform other household tasks like cleaning the boat, and car. 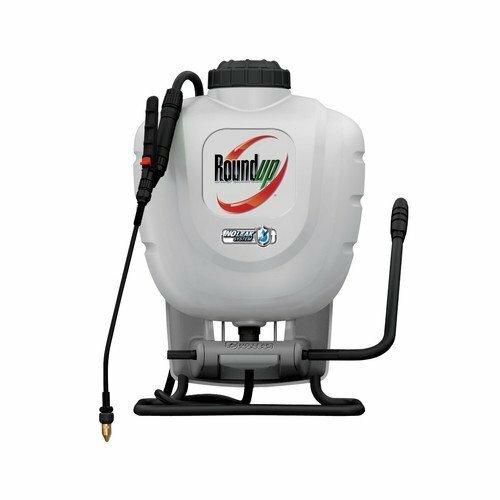 If you have some compost tea that you need to apply to plants in confined spaces, then the backpack sprayer is the most ideal – think of those indoor plants that you keep hidden from the glare of everyone. With a backpack sprayer, you can apply a range of pesticides, and fertilizer efficiently saving you from the trouble of having to handle the chemical with your bare hands. However, you may need different tanks for each task to avoid cross-contamination – one for the cleaning agents, one for fertilizers and another for the pesticides. Mode of operation: depending on your budget and preference, a backpack sprayer is either manual or motorized. 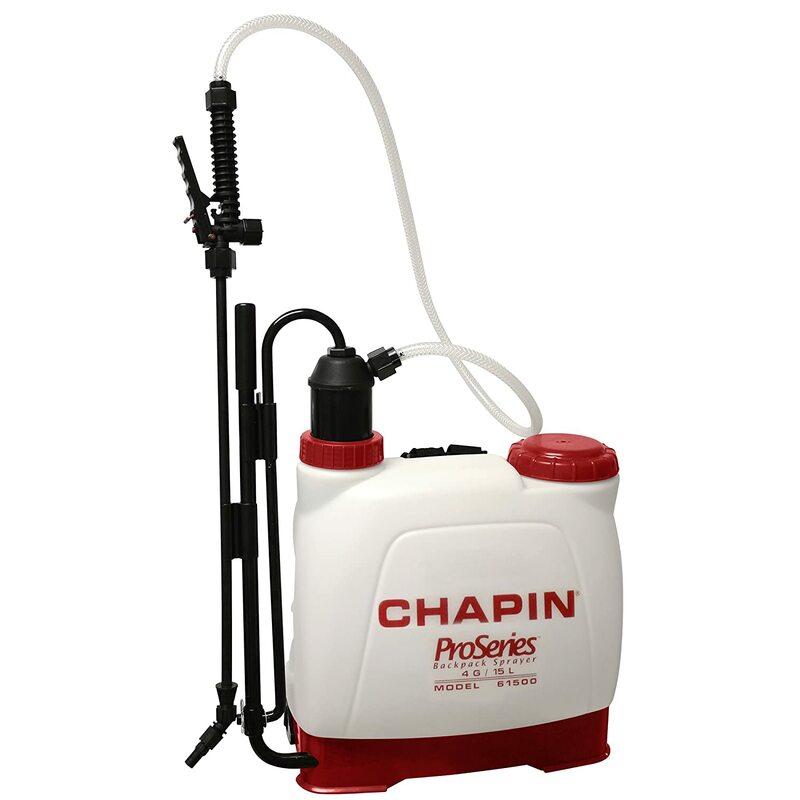 The manual backpacks require you to use the hand pump to prepare the liquid for pumping by pressurizing it. Because of their low price, they are the most common. These hand manual backpack sprayers are not easy to use as they are associated with hand fatigue. The motorized backpacks use a heavy duty battery to make your task so much easier. You are quicker and more efficient with motorized models. However, they are a bit heavier, more expensive and require maintenance to ensure they are working in perfect condition. Power: there are typically two types of power utilized by backpack sprayers. The first is piston pumps sprayers where the up and down motion creates about 90 psi of pressure. This kind of backpack does not require you to have deep pockets to acquire them.There also those that use the more expensive diaphragm sprayers. Among the differences with piston pumps is the absence of internal cylinder. Pressure is created by moving the diaphragm through pumping. Diaphragm sprayers are more rugged to handle abrasive chemicals than the piston pump types. They will also be in a position to create adequate pressure when needed. This sprayer is, however, more expensive and demand more maintenance to keep them in good working condition. The Durability and Maintenance need: the best sprayers are made from the durable high-density polyethylene material rugged enough to take the bite off the most chemicals. It should preferably be UV-protected and leak-proof. Safety and Comfort: modern backpack sprayers come with extra features for added comfort and safety. This may incorporate contoured tanks and padded shoulder straps among others for more comfort to enhance efficiency. A comfortable model will make garden maintenance a fun activity for the whole family. A lockable Mechanism: ideally, go for the backpack sprayer that comes with a shutoff mechanism to control the release of the chemicals and liquids. Mostly, this lockable shutoff mechanism is vital for safety and efficiency. The quality of the Wand: a leaking wand is a source of significant trouble and a recipe for horror stories. The construction and the material of the wand are critical since it forms the conduit through which various chemicals will be passing. In ideal situations go with brass and stainless steel fittings – something rugged to withstand the abrasion and abuse associated with frequent chemical use. Comfort: choosing devices with padded shoulder straps and a harness makes the task of spraying much easier. Adjustable straps allow individuals to vary them to a comfortable level. To get the best out of backpack sprayers, make sure to lubricate the seals and O-rings at least once every year. During extremely cold weather conditions, use automotive antifreeze on the seals and pumps. Be careful as these chemicals are extremely toxic and their disposal needs to be done in a particular manner. If you are a gardener, one of your biggest worries when spraying insecticides may be leakage. You may have come across stories of chemical-charred backs that may have discouraged you. This backpack sprayer comes with an internal no-leak design delivering up to 150 psi – quite reasonable. The 21-inch wand is durable and has maybe the highest quality Viton seals to handle various chemicals comfortably. This product’s lockable shutoff incorporates brass components for added durability. The idea of having a pump backpack sprayer is not such great one for some people. This backpack is the real deal for as it makes spraying an effortless activity. The pressure is powered by 8 AH LEAD ACID BATTERY with a cheap and adequate charge to go for long. And for convenience, the backpack has battery level indicators. This product also has an adjustable pressure and a changeable nozzle output to match your crop requirements. The wand is designed to withstand a variety of chemicals and comes with a curved tip for on-target spraying. The best backpack sprayer is one which is easy to use and maintain. In that regard, this product scores high points with an easy to repair pump design – no tools needed. 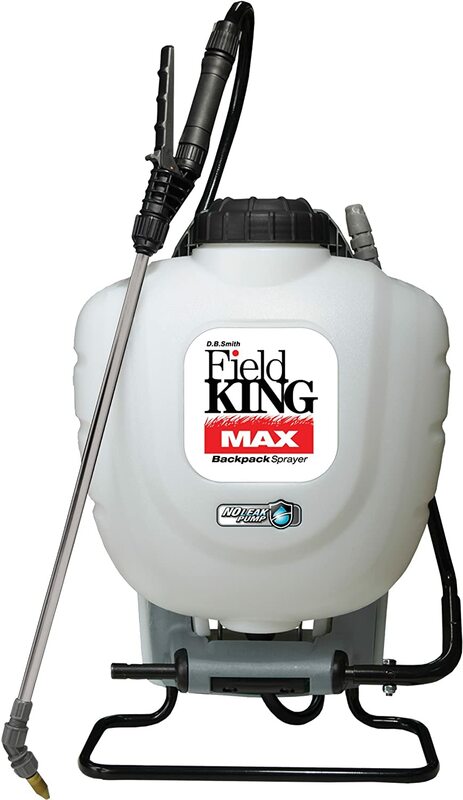 For varying spray patterns, this backpack sprayer has four nozzles. And to ensure the product achieves a probably sufficient chemical resistance, it comes with high-quality Viton seals. The shoulder straps are padded to make it easier to carry. The good thing about translucent backpack sprayers is that they are easier to fill and clean. 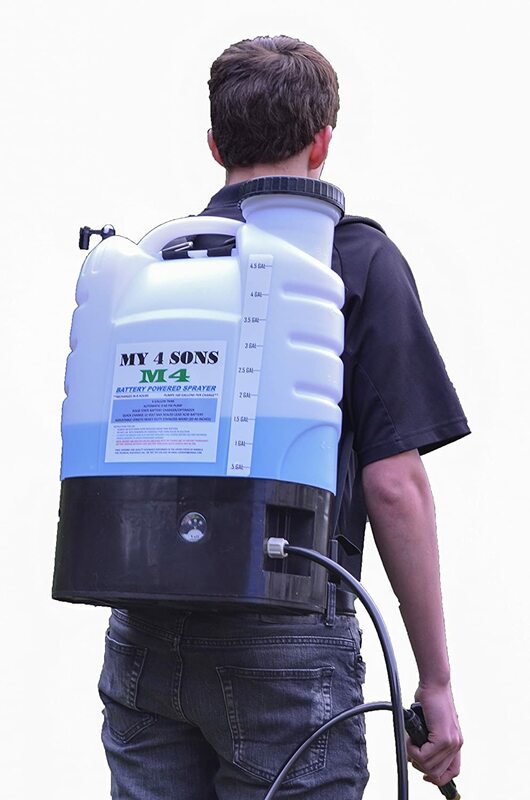 This sprayer can carry four gallons of pesticide and is easy to carry around – has padded shoulder straps. The sprayer comes with two nozzles for varied options. Its spray tip is adjustable to give you more options and reach. This means that you can use it in hard-to-reach places. However, it is a piston-powered sprayer and may take a considerable amount of energy to operate. 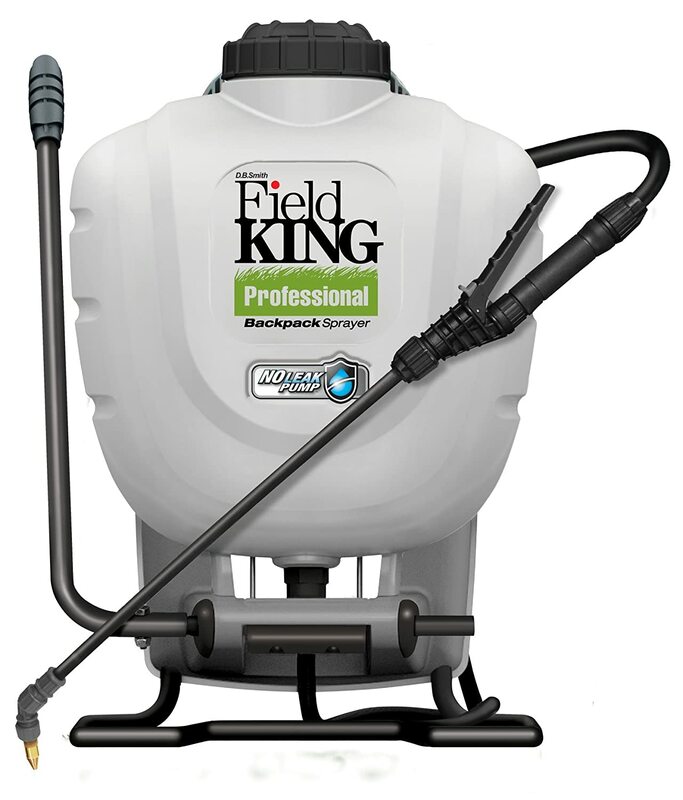 Field King is a powerhouse when it comes to making gardening maintenance products, and this backpack sprayer is yet another proof of that. This product has a no-leak design ensuring that your back is safe from corrosive chemicals. The wand is constructed of stainless steel and has durable Viton seals. Should you need to, you can change these seals within minutes and without any tools. It also has a threaded bolt for attaching the handle. A backpack sprayer is one versatile tool that every gardener should never be without. It is through it that garden maintenance is possible. The option you choose must be easy to use, has a decent pressure and varied spray patterns, is easy to carry around and is durable. The 4-Gallon Battery Powered Backpack Sprayer Wide Mouth is one good sprayer that will make spraying crops quite enjoyable. You only need to carry the backpack to where the plants are, point the wand and spray – no need for pumping. There are other backsprayer reviews available too!